I said I wouldn’t, but a reader has asked about three particular points in the last section of Shapiro’s book, where he explains his personal view of the authorship question, so I figured I might as well deal with as many of his points as seemed worth discussing. The main problem with Shapiro’s defense of William of Stratford as author of the Shakespeare canon, is the same problem all Stratfordians have, namely an unshakable belief that the name Shakespeare as used in publications could not possibly mean anyone or anything other than the man who was born with it. This makes it impossible for them to respond to the Authorship Question in any real way because it prevents them from seeing that, at that time in history, such a name could rather easily have been used for another purpose. Over and over Shapiro’s points are useless as arguments because to him the word Shakespeare can only mean William of Stratford. Of course this works for readers who share his blind spot, but for those who have done enough reading or had enough experience of life to see that the man with the punnable name could not possibly be the real author, it’s all just wasted space. Take for instance his point regarding the many comments on Shakespeare by his fellow writers, that “stretch without interruption from his early years in the theater to his death in 1616” (234). This falls by the wayside because he’s assuming that in praising the author they mean William when what they so obviously mean is the author. Apart from Greene’s “Shake-scene,” which wasn’t about either William or the author, Shapiro quotes one writer after another, all their praise of Shakespeare utterly and totally beside the point, since not one of them touches on anything that would lead us to think that they knew or believed that the author originated in Stratford, had a father named John, dealt in wool, or anything that might connect the author in any way, subtle or obvious, with William of Stratford. Not that the London writers would necessarily have mentioned Stratford even if the author had been William, but the point here is that this rehearsal of praise by Shakespeare’s fellow writers carries no weight whatsoever in the authorship debate. Of course they praised their great contemporary, but where’s a single point that shows that the Shakespeare they were praising was the one who came from Stratford-on-Avon in Warwickshire? This brings us to Ben Jonson, whose dedicatory Ode in the First Folio is a classic example of the sort of fudging that cries out for disambiguation. As evidence, Jonson’s Ode does more for the opposition than it does for its putative author, since the only thing that connects it to William is the phrase “sweet swan of Avon.” This contributes nothing to the apparently difficult business of directly identifying the author for although a river by this name flows through the Stratford in Warwickshire, another Avon flows past the Wiltshire estate of Jonson’s great patron, the Earl of Pembroke, Lord Chamberlain of the King’s Household, patron of Shakespeare’s Company, the King’s Men, and the book’s dedicatee. There is one more reference to Stratford in the introductory material in the First Folio, though no less ambiguous. Leonard Digges, Jr. provides a poem that contains the line, “thy Stratford moniment.” During the final years of Oxford’s life, his official residence was a manor in Hackney, three miles from Stratford-at-Bow where the ancient Roman Road crosses the River Lea, continuing northeast to Oxford’s childhood home with Smith at Theydon Mount and beyond that to lands ruled by his ancestors. If, as I believe, Oxford escaped domesticity once again to finish his writing during the final four years of his life in the Forest of Hainault, he must needs have crossed the river at Stratford, that being the only crossing over the River Lea, and headed northeast another 12 miles to Havering-at-Bower. So which Stratford does he mean? Which Avon? And why doesn’t he make it more clear? As for Jonson “proudly” listing Shakespeare first as one of the actors in his first play for the Lord Chamberlain’s Men, please note, again, that this information comes from someone whose entire career was spent working for Shakespeare’s company, the Lord Chamberlain’s/King’s Men, from whence cometh every single piece of evidence linking the name Shakespeare to the London Stage and the works that made them wealthy men. Shapiro’s mention of William Camden, who listed “William Shakespeare” as one of eleven “pregnant wits” (237) in 1605 is even more ironic, for among Camden’s comments on the important personnages from the various towns and counties throughout English that make up the bulk of his Britannia, the only names he mentions from Stratford-on-Avon are John de Stratford, Hugh Clopton, and George Carew (Jiménez 1). But, how could he not mention that pregnant wit, Will Shakespeare? How indeed? Shapiro likes the term crushing for what he considers a potent thrust. I’d call this crushing. Even more crushing is the evidence from Michael Drayton, whom Shapiro characterizes as a “fellow native of Warwickshire and a leading poet and dramatist” who “may have known Shakespeare longer than most” (238) and whose admiring verse about him he quotes. But what Shapiro fails to note is how Drayton ignored his supposed friend in his book Poly-Olbion. Published in 1612, this description in verse of England, while it comments on the important personages from each county, ignores both Stratford and William Shakespeare (Jiménez 3). If Shapiro’s got an explanation for either of these gargantuan lacunae I’d like to hear it. Shapiro points to the number of Shakespeare’s plays published from 1594 on (a genuine fact), from which he leaps to the conclusion that Shakespeare was “one of the most familiar faces in London” (224), a logical fallacy if ever there was one. I read The New Yorker and am well-acquainted with the names of the more frequently published contributors, but I could pass any one of them on the street without recognizing them in person. And as it turns out, the man who was born with the name William Shakespeare was anything but well known in London. In his article Ten Eyewitnesses, historian Ramon Jiménez outlines in devastating detail how William of Stratford remains a total blank as either a playwright or an actor throughout the entire period of Shakespeare’s popularity, utterly unremarked by the actors who produced the plays, utterly unremarked by his own townsfolk and relatives! As witness to Shakespeare’s Stratford identity, Shapiro calls upon George Buc, Master of the Revels from 1610 to 1622, who knew (and honored) the Earl of Oxford, and who also wrote that “Shakespeare” told him that The Pinner of Wakefield was written by a minister who enacted the leading role himself. Again we see the strange Stratfordian blindness to the central issue, since, again, to theater people like Buc, “Shakespeare” would have meant the author! Committed to protecting his friend’s privacy, of course an insider like Buc would refer to the source of this information by the name he used for theater matters, not by the name he was bound to protect! Now, whether or not we Oxfordians are right, the fact that Shapiro and his colleagues think this is any kind of an argument shows better than anything we can say how utterly clueless they are about the argument itself. It’s like a six-year-old arguing with a four-year-old over whether or not there’s a Santa. He simply doesn’t want to believe it. We see the same problem with his next argument, i.e., that Shakespeare had no control over his plays because in those days plays were owned, not by their authors, but by the acting companies that purchased them. This again is an argument with little foundation, for even Ben Jonson had enough control over his own plays by 1616 to publish them as a collection. In any case, since Oxford was a peer of the realm and a lifelong patron of acting companies with relatives and patrons of his own on the Privy Council, were he also the author of the plays that bore the name Shakespeare, then of course he (and his relatives on the Privy Council) had considerably more power over what happened to his creations than would a yeoman’s son. Again, the argument only works if you believe that William could write, which we don’t––based on the evidence of the six shaky signatures and the utter lack of any evidence of letters, etc.. So there goes that argument, round and round in the usual circle: William was the author, the author could write, therefore William could write and the signatures were lopsided and close to illegible because he had the palsy, or was dying, or, or, or, or . . . . Anything to keep from facing the truth. The argument about the hyphen is interesting but hardly compelling one way or the other. It’s true that hyphenation was largely controlled by the printer’s compositor. It’s also true that fictional names were often hyphenated, but then they were also often left unhyphenated. One facet of this argument that hasn’t been mentioned anywhere but here is that hyphenating Shakespeare between Shake and speare forces a particular pronunciation that turns the name into a pun: “shake spear,” whereas most of the spellings from Stratford suggest the name, if hyphenated as pronounced in Stratford, between Shaks (or Shax, or Shags) and peer, would have been “shax peer,” which implies nothing. Shapiro notes that only 600 of the estimated 3,000 plays produced during the Elizabethan era were printed, and that none of these, “so far as anyone knows,” were printed under someone else’s name (226). Ah, there’s the rub! True, the valiant authors who took such risks to get great works of fiction into print managed to cover their trails to the extent that there are many things that “so far as anyone knows” can’t be documented. But it’s also true that “truth is truth though it be hid at the center,” and there is always a way to get at it by digging a little deeper and using one’s God-given common sense, not to mention that most indispensable of all tools when dealing with Shakespeare and his audience, one’s God-given sense of humor! Ignoring his own statement that Shakespeare was “one of the most familiar faces in London,” Shapiro suggests that a playwright anxious about being identified could simply have let the play be published anonymously, for “nobody would notice and nobody would care” (226). It may well be that this was what the Lord Chamberlain’s Men were hoping at first, since beginning in 1594, all the Shakespeare plays published until 1597 were published anonymously. And it’s just as obvious that, for whatever reason, this wasn’t satisfactory since from 1597 on, almost everything published had the Shakespeare name on it (or at least W.S.). What reason does Shapiro give for the first three-and-a-half years of anonymity before switching to a name in 1597? None, beyond the statement that anonymity was “typical. ” How “typical” was it in 1565 when Gorboduc, a first in English theater history, was published along with the names of both its authors? Ten years later, when the next two plays of importance in literary history, The Supposes and Jocaste, were published in One Hundreth Sundrie Flowres, the (supposed) author of both plays was also identified. So I guess publishing plays anonymously wasn’t all that typical after all. Shapiro scoffs that a writer who craved anonymity would dare to attribute his published plays to a well-known actor who could be hauled in for questioning, thus supposition is supported by more supposition, for the truth is that Shakespeare was not well known as an actor either. Facts are facts, and the fact is that nowhere is there a dependable reference of any sort to Shakespeare as an actor––that is, again, except on statements issued by the LC/King’s Men or by clerks simply writing down what they’d just been told. Compare these with the number and kind of anecdotes about about the genuinely important and well-known actors of that time: Bentley, Tarleton, Alleyn, and Kempe come to mind, it’s clear that William Shakespeare’s acting, whether fictional or real, was insignificant, since the only comment on it ever discovered states that “he was said to have played old men,” hardly a recommendation for the kind of talent that Jonson awards him by putting his name first in his list of actors in several of the plays he wrote for Shakespeare’s company. More likely, it suggests a dodge on their part, since no role played by an actor would disguise a man so completely as that of an old man’s wig, beard, and shambling affect. Shapiro wants to see the name of the author of the plays given at Court in 1604 (for Oxford’s daughter’s marriage), inscribed as “Shaxberd,” as “powerful evidence” of William’s authorship (228), but if William was “one of the most familiar faces in London,” how is it that the Court scribe in 1604 not only didn’t know how to spell his name, he didn’t know the name itself well enough even to make a good guess. “Shaxberd” is not only a misspelling, it’s a mispronunciation, for Shaxberd sounds nothing like Shakespeare! Clearly there was a Court scribe in 1604 who knew so little about the author (or his standin) that he could only write the name as he heard someone else pronounce it, someone who also, it seems, either did not know the author and/or did not how his name was spelled or how it was pronounced. A man of the theater? Shapiro makes a big thing out of the fact that Shakespeare had to be a man of the theater, skilled in writing for particular actors. This of course is true, but where are the facts to back his knee-jerk assumption that the writer was William? Where are the facts that go beyond the handful of documents created by or about the Lord Chamberlain’s Men, the sole source of evidence that he was either an actor or a sharer? And how are we to compare William’s connection to the theater when his name shows up nowhere in any record of an acting company until he’s 26 years old, and who, it seems, leaves London at the peak of his career to return to suing neighbors in his hometown for piddling amounts of money, whilst apparently ignoring the publication of his plays? How then does William as a man of the theater compare with Oxford, who created entertainment for the Court in his early twenties; had his name on the lease of the Children’s theater at Blackfriars in his thirties; was listed as “best for comedy” by Meres in his forties; had his life story touched on in almost every play that bears the Shakespeare name; and had every reason to hide his identity as author of plays that tell, not only his and his family’s story, but damaging insider views of the leading personalities at Court and in the government? Where is there any evidence that this or any other such epilogue was ever intended to be spoken by the play’s author? And even if playwrights ever did speak such epilogues themselves, why on earth would this one include his personal remarks in a playscript given to the entire company? For that matter, why even bother to write it down? Surely such a moment would be more conversational than programed. Point being: Shapiro profers no evidence that this speech was intended to be spoken by the author of the play, first because it would make no sense, and second because there’s no evidence! What we do have in the way of evidence are twelve Shakespeare plays in which such an epitaph is included in the playscript, and in every one it is an actor who is to remain alone onstage at the end in order to address the epilogue to the audience. Among such are Puck in A Midsummer Night’s Dream, Pandarus in Troilus, Rosalind in As You Like It, and Prospero in The Tempest. So the actual probability is that the Court epilogue was written for the same actor who spoke a similar epilogue for the public, published just before this one in 1600, namely Will Kempe, a comedian familiar at Court since the early ’80s at least. Written in Kempe’s style, the wording suggests that the actor who was intended to speak it was the lead in whatever play had recently displeased the Court. This, as Shapiro suggests, was most likely its immediate predecessor, Henry IV Part One, a play that caused a Court scandal over its use, or rather misuse, of the name Oldcastle, the original name for Falstaff and the role played by Kempe in both plays. The most displeased courtier would have been William Brooke, a descendant of the original Oldcastle, who was regarded as a regular Reformation saint by his Cobham descendants. William Brooke, Ld Cobham was also at that time Lord Chamberlain of the Queen’s household and thus the patron and overseer of Shakespeare’s company. Since Cobham, for reasons of his own, was acting against the interests of the company he was supposed to be patronizing by blocking their use of the theater at Blackfriars, it’s understandable that the angry author struck back by sticking his ancestor’s name on the naughty fat knight, an act of defiance perfectly understandable if commited by someone of Oxford’s exalted status, but near suicidal if by someone like William. As for “all that begging and curtsying” noted by Shapiro, while not appropriate for a courtier, how does it better suit William of Stratford than Will Kempe, who having played the role in Henry IV Part One, played the same role in Part Two, gave the first version of the epilogue in the public performance of Part Two, and who, if in trouble over “Oldcastle,” would have been required to make amends with just such a statement? And it was Kempe, not the author, whose portrayal of the naughty knight would have reduced the Court audience to the kind of hysterics that would have infuriated Cobham, and so it would, again, have been Kempe, speaking for the whole company, whose job it was to make the necessary apology. Shapiro finds significance in the line: “What I have to say is of my own making . . . .” What this actually suggests is that with Kempe’s tendency to extemporise in mind, the author was doing what he could to force the comedian to take responsibility for any ill-considered departures he might make from the script while directly addressing the Court audience. That Kempe left the LCMen at about this time and took off on his own comedy tour is a known fact, though it is not known whether he did so by his own choice, or whether his departure was a decision made for him by the company, or perhaps by some higher authority––the Lord Chamberlain perhaps? In any case, there’s absolutely nothing in the nature of this anecdote to suggest that it was the author of the play who spoke the epilogue. Nothing, that is, but a desperate desire on the part of a Stratford apologist to find something, anything, that shows William as a participant in the London theater scene––the same desperate desire that fuels the constantly repeated claim that Robert Greene had William in mind as the “Johannes Factotem” and “Shake-scene” of Groatsworth. As we’ve explained at length over the past twenty years, there’s no one who could possibly have filled that role in 1592 but the actor Edward Alleyn, England’s first superstar and recently turned stage manager at the Rose. Shapiro shares his gullibility in these points with most Stratfordians, but he’s largely on his own with the contention that it was “Mr. Shakespeare and Richard Burbage” who created the impresa for the Earl of Rutland in 1613 (231), for most orthodox Shakespeareans are inclined to take this with salt. The notion that either Shakespeare or Burbage would step out of their exalted roles as playwright and leading actor of what was by then the King’s own royal company to do something so lowly as make something with their hands for a mere handful of shillings, or that the earl would request it of them, is patently absurd. Rutland may have turned to his friends at the theater knowing that they had the connections for getting props made for plays, but that they made it for him themselves makes no sense. Whatever the explanation, it’s clear that attempting to base a theory of identity on such dissociated bits smacks of desperation. Consider the kind of rich and authentic background we have for Ben Jonson, or even Christopher Marlowe, as compared to puzzling little fragments like this, and you can see how void is the the history of the period with anything supportive of the Stratford claim. Shapiro: “Shakespeare had been writing plays for five or six years before one of them, Titus Andronicus, was finally published in 1594. 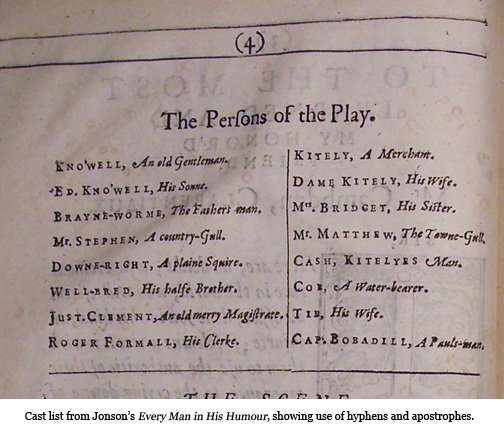 Its title page advertised the names of the playing companies who had performed it, not who wrote it. This was typical. Even the most celebrated plays by the most popular Elizabethan dramatists appeared anonymously. We have no documentary evidence that Christopher Marlowe wrote Tamburlaine, and if not for a casual allusion by Thomas Heywood in the early seventeenth century, Thomas Kyd’s name would not be linked to his masterpiece from the late 1580s, the Spanish Tragedy” (226). This is an example of how events can be misread when seen without the necessary background. February 1594, when Titus was published, was the beginning of the end of the chaotic period––1588-1594––when the newborn theater industry was in most danger of being destroyed by its government and church enemies. Marlowe, author of London’s first superhit, had just been assassinated, while within four months Marlowe’s patron and patron of the company that produced it, would be poisoned to death. That Titus and the two other Shakespeare plays published that spring were published anonymously just then can’t be seen as “typical” of anything. The statement that “even the most celebrated plays by the most popular Elizabethan dramatists appeared anonymously,” blandly ignores the fact that Shakespeare, Marlowe, and Kyd, or, more accurately, Shakespeare, Marlowe and Lyly, were not just the most popular Elizabethan dramatists in 1594, they were the only Elizabethan dramatists in 1594! Fact: there was no such thing as a professional playwright in Elizabethan England in 1594, nor would there be until Ben Jonson arrived on the scene later in the decade! This was the dawn of the English Renaissance! This brief period (from 1587 when Marlowe had his huge success with Tamburlaine) was the real birth of the English commercial stage as something more than a rich man’s toy. In fact, if we eliminate Lyly, (whose biography places him in the company of empty names like Robert Greene and Thomas Nashe), we have only two “most popular Elizabethan dramatists,” during the short period of 1594-1597: Shakespeare and Marlowe. And since we know how Marlowe’s attempts to function as a professional served him, we’re left, between 1593 and 1597, with only one: Shakespeare! And so, without plunging into deep background, suffice it to say that with Shakespeare’s plays getting no accreditation, it’s no surprise that whoever published Marlowe’s Tamburlaine in 1590 left his name off the title page for the same reasons, whatever they were. As for Kyd, it’s so doubtful that he wrote anything but (perhaps) the translation of Tasso that’s the only thing that actually bears his name, that any comments on the authorship of The Spanish Tragedy belong to a separate discussion. Shakespeareans are still a bit mystified by the motives behind the Pavier quartos. Whatever led to their publication [in 1619], it’s obvious that surprisingly little time elapsed from news of Shakespeare’s death to determined efforts to see his collected plays in print” (241). One might almost guess that the Grand Possessors had been waiting for the proxy to pass out of reach of any questioning before they moved to publicize his connection with the canon. And how about the fact that the finished book didn’t reach the bookstalls until a few months after Stratford’s wife too had passed on in August of 1623? Shapiro’s comments on the dedicatory poems raise the issue of Leonard Digges, Jr., author of one of the poems in the Folio, and of another in one of its later editions. Digges was the grandson of the scientist Leonard Digges, an in-law of Sir Thomas Smith, Oxford’s tutor for the most formative years of his life. No doubt there is more grist for my mill in Shapiro’s book, but this has gone on long enough. I must admit he has put one thing better than anyone else I’ve read, namely the paragraph on the “syndicate” that formed to produce the First Folio (241). I’m also pleased to note that he mentions my name as the author of an article published in Shakespeare Matters and makes frequent reference to articles published in The Oxfordian during my tenure as editor. His list of Oxfordian scholars, articles, books, etc. in the final Bibliographic Essay is perhaps the most complete anywhere in hardback. Like Alan Nelson and so many other orthodox scholars, we’d be a lot less well informed without him. Too bad however that the right hand still remains so ignorant of what the left hand is doing; or perhaps I should say, that the left brain of English Literature (the Lit Crit crew) remains so utterly ignorant of what the right brain does (the artists themselves), then, now, and forever, world without end. This entry was posted in anonymity, Authorship Question, Shakespeare Authorship and tagged authorship question, Contested Will, Earl of Oxford, James Shapiro, Shakespeare Authorship. Bookmark the permalink. listen/read there is more to be discovered. One thing that has always bothered me and I’m not sure whether or not you have covered this. Why did Meres list the Earl of Oxford and Shakespeare separately? Is it because he simply did not know they were the same person? Also, if Oxford never published any plays in his own name, how would Meres have even known that he was “best for comedy”? Can I assume that there were some works published in his name but have gone missing? Bless you for the compliment. It makes this effort worth it. The publication of Meres’s book in 1597-98 comes at that point in the life of the Lord Chamberlain’s Men when the authorship first began to be a real problem. This is the period when forces on the Privy Council were making it impossible for Burbage to take advantage of the theater he’d just created at Blackfriars, when the Queen named an enemy of the Stage as Lord Chamberlain, when the fight took place over the naming of Falstaff, when the Isle of Dogs caused such a ruckus that the Council threatened to shut down all the theaters and threw the authors in jail, and when most notably Oxford’s enemy, Robert Cecil, had assumed the office of Secretary of State and Ld Hunsdon was no longer around to protect the company. This was also the time when the plays stopped being published anonymously and began showing the Shakespeare name. The most likely reason for some of this was that the plays, now rewritten in the style we know as Shakespeare’s, were becoming so popular that the question of who was writing them became a real issue for the first time, one that Hunsdon was no longer around to help resolve. The Privy Council got involved, and to save the company and keep the plays coming, the decision was made to separate Oxford from the revised plays by attributing them to this heretofore totally unknown entity whose name Oxford had already used on Venus and Adonis. Through his life-long connections to the Stationers and the censors whose job it was to pass on manuscripts preparing for publication, it would have been easy enough for Burghley to pick Meres’s book and have one of his secretaries (Michael Hickes?) suggest that they’d make it well worth his while to add a few lines about Oxford and Shakespeare, lines that made it clear that they were two separate entities. By attributing only his comedies to Oxford, the danger that Polonius would be identified as Burghley or Cecil as Richard III was eliminated, for the satirical portraits in the comedies were either of persons like Henry Evans, Antonio Perez or Don John of Austria, or they were oblique enough that no one could tell who was being trounced. (If Shallow and Slender were Leicester and Sidney, both were dead, while neither Mary or Robert Sidney were at Court to protect their memories). The most likely figure on the Council to have acted to protect the actors (and Oxford) was Ld Charles Howard, a long time patron of the Stage and, due to his victories in the Armada fight, had become one of the most influential members of the Council. Another player may have been Oxford’s son-in-law, the Earl of Derby. Thus little by little, the identification of the author as William Shakespeare of Stratford began, each time as a quick fix to an increasingly troublesome problem, how to keep the company and the plays without outing their author. Impressive English prose: fluid, lucid, and even ironic and witty. Specially the moments when the pang of your stricken brass resounds like this: “It’s like a six-year-old arguing with a four-year-old over whether or not there’s a Santa. He simply doesn’t want to believe it.” Cool . . . .
I’ve come from Mr. Whittemore’s website. I’ll be around here too! Thanks very much. It is a very plausible scenario. Do you know if in fact Meres had the kind of relationship with Oxford that might have facilitated this venture? It’s most unlikely that Oxford had any connection to Meres, about whom nothing relevant is known except that he is the author of Wits Treasury, of all of it, that is, but the few sentences that someone who had the power to do such things, slipped into it. Oxford made it easier for the Lord Chamberlain’s Men through his lifelong habit of maintaining as low a profile as he could, but from the time the LCMen began publishing his works, creating and maintaining his cover was their job, theirs and the patrons on the Privy Council whose true role in the English Literary Renaissance, the birth of the London Stage and the commercial periodic press, has never been properly told. Stephanie, you shouldn’t be surprised that Jonson didn’t make things more clear concerning “thy Stratford moniment,” for the reason that Jonson wasn’t the one who mentioned it. Yet you do reference the poem that does refer to it, the one by Leonard Digges, but that’s all you do, right at the end — you mention it, but make no effort to account for it. But it demands an explanation. When you attributed it to Jonson you pretended to believe that ‘Stratford’ could equally mean “Stratford-at- Bowe, a mile or so from where Oxford was living the last ten years of his life”. First of all, a mile or so, especially in those days, was not a negligible distance, so why would there be a monument to Vere in some place with which he had no connection, and where there is not a scintilla of evidence that there ever had been a monument to him, or Shakespeare, or anyone associated with this entire business? At least there was a monument in Stratford-on-Avon, and there was a man called William Shakespeare who was resident there, so I’m afraid that your “explanation” leaves you up a creek without a paddle. If you want to make the case that Digges had somehow been ‘got at’, perhaps not-too-subtly persuaded to toss in that seemingly innocuous (but presently mischievous) allusion to Stratford, you need to say so, or supply some kind of plausible explanation, even if not demonstrable. Saying “I simply can’t explain it” would be equally satisfactory. I know I can’t account for Digges’ words. You’re right, it was Digges who mentioned the “Stratford moniment,” not Jonson (whose sole reference to William was the single word “Avon”). [I’ve since mended the incorrect statement.] And right again that Digges was referring to the monument in Trinity Church (sloppy thinking on my part). Nevertheless, this has nothing to do with the point, which is that nothing, either the Folio itself or the monument, made any sort of direct statement that the Shakespeare who wrote the plays was he who seemingly spent most of his life in Warwickshire. By 1623 the Grand Possessors must have felt that the monument in Trinity Church, originally created by William (with LCMen money) for his father, had been sufficiently altered (altared?) that it could pass as testimony that William, putative actor and sharer of the LCMen, was who they said he was. Certainly as Ogburn and many others have pointed out, the wording on the monument is just as ambiguous as is the material in the First Folio when it comes to making any sort of direct statement that William was the author of the plays that bore his name. Half in Latin, the English half claims only that “all that he hath writ leaves living art but page to serve his wit,” not exactly what you’d call a direct statement. As for what Digges meant, he was simply repeating the text opposite the Droeshout engraving, that Shakespeare’s works were his true monument. I agree and would add that Shapiro makes much ado about the problem of speculation, only to indulge in at every turn when it suits him. Has there been some new information come to light lifting the cloud over “Buc’s testimony”? Was it not Collier that “discovered” it? And, wouldn’t a “scholar” be obligated to at least footnote the problem with the particular “evidence”?